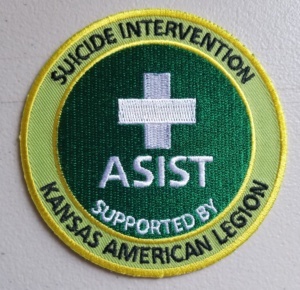 April 28th – 29th 2018, the Gardner American Legion Post 19 hosted an Applied Suicide Intervention Skills Training (ASIST) led by Kelli Pfau and Captain Kate Alegado with the US Army Reserve. We had such a great group that came together for a powerful workshop! Members from all Post 19 groups that attended were Commander Abe Revira, Auxiliary President Sheri Barber, Auxiliary Vice President Danedri Herbert, Debbie Austin, Chris Claxton, Skip Herbert, and Deedra Revira. Your American Legion Family cares about you. Don’t be afraid to ask for help. You can call the National Suicide Prevention Lifeline for 24/7 confidential services at 1-800-273-TALK (8255) or visit their website. We also have many other resources listed below and on our Veteran’s Assistance page. For emergency services please call 911. ASIST Patch awarded to all attendees.